"From the 'pulsing sunlight' of the Vatican to her childhood home of 'lavender—resting in demure retreat,' the images of Margaret's poems are unique and richly woven. Her artful attention to detail held me in these emotional and physical landscapes, wanting to hear more and go further. I feel fortunate to have experienced these tapestries of words." "In these vibrant, full-bodied poems, Margaret Bryant embraces the whole of 'humanscape,' from the ordinary to the sublime moments of her well-lived life. Her words are hearty, filled with solid things that satisfy a basic human need for sound. If you are wise enough to know that enthusiasm, and exclamation marks will never go out of fashion in poetry, you will want to read this joyful, generous book." 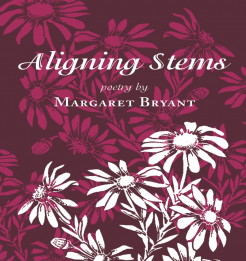 Margaret Bryant is a published poet and essayist who, approaching her seventieth birthday and fortieth wedding anniversary, envisions life's experiences as a bouquet in progress. The colors of life in perspective change, even momentarily, as we align the stems to make room for fresh blooms and hues and are forever touched by those we put aside.